Our Scholarship Program is developing year on year with the selection, development and success of our athletes. 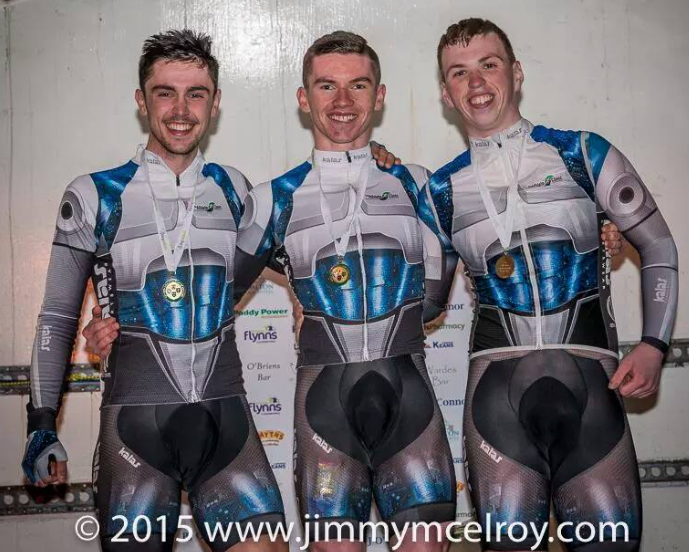 The success of Daire Feeley with over a dozen domestic wins in 2014 then representing Ireland at the European & World Junior Cycling Championships was outstanding and then in 2015 the riders produced 12 Elite wins, 7 Classification Jersey’s, 1 Stage Race General Classification amoungst other podium and placings and all riders graduating from A3 to A1 shows constant performance improvements and results throughout the program. To cap off our success to date and entry into the Elite/Espoir Category Team iTap become 2015 Irish National Criterium Team Champions. Picture below showing Darragh Bailey, Daire Feeley & David Brody receiving their medals on the podium. We have officially namied our Project “iTap” the “Irish Talented Athlete Program”. The “iTap” web site provides a platform for our network, social media and marketing potential. The platform generates 200,000+ hits on a monthly basis and this is excluding the audience from our riders and supporters. Its growth and development provides a valuable platform for our partners and sponsors to promote their business and associate with a world class athlete development program. This will provide partnership and sponsorship opportunities which are vital for iTap to develop into a world class Talented Athlete Program. iTap coaches Junior Cyclists and they remain as an apprentice to the Team until they are senior. The Junior Rider will spend his time as a Junior with his home Team but avail of the iTap Coaching and Development Program. Once completing their apprenticeship and becoming a Elite Senior riders they will become full Team members and rider in the colours of iTap. Rider application is by way of sporting cv submitted through our email at irishtalentedathleteprogram@gmail.com. All athletes are requested to sign contracts with iTap for the duration of the agreed apprenticeship & scholarship. The contract is designed to protect the integrity of the program and also our sponsors and partners without whom this program would not be available. iTap subscribes to WADA and all there requirements for Anti Doping Protocol. While an athlete has taken a year or two out of college to see if they have what it takes to become a professional full-time athlete the program aims to provide all the support needed to accomplish during this time. Services such as Individual Coaching, Physio, Injury Management, Sports Massage, Nutrition Programs & Advice, Training & Racing Kit & Equipment, Team Car & Support at all major events among others will be provided. Across our platform we have Facebook, Twitter Instagram & our YouTube page all packed with up-to-date info on the Team its riders and staff. This is continuously updated.